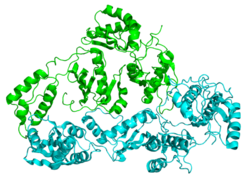 Reverse transcriptase is an enzyme used to generate a complementary strand of DNA (cDNA) on an RNA template, a process called reverse transcription. Howard Temin in the 1960s proposed a hypothesis of a DNA intermediate in retroviral replication. Howard Temin and David Baltimore discovered independently the Reverse transcriptase enzyme and both, along with Renato Dulbecco, were recipients of the 1975 Nobel Prize in Physiology or Medicine. 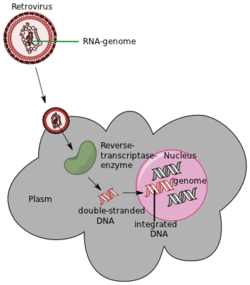 Reverse transcriptase has important applications in molecular biology, including reverse trancription-polymerase chain reaction and the compilation of cDNA libraries. ↑ Alberts, Bruce; Johnson, Alexander; Lewis, Julian; Raff, Martin; Roberts, Keith; Walters, Peter (2008). Molecular Biology of the Cell (5th ed.). New York and London: Garland Science. p. 542. ISBN 0-8153-4105-9. ↑ 2.0 2.1 Dimmock, N. J.; Easton, A. J.; Leppard, K. N. (2007). "8: The Process of Infection: IIC. The Replication of RNA Viruses with a DNA Intermediate and Vice Versa". Introduction to Modern Virology (6th ed.). Malden, MA/Garsington Road, Oxford: Blackwell Publishing. p. 115. ISBN 1-4051-3645-6. ↑ Carter, John; Saunders, Venetia (2007). Virology: Principles and Applications. New Jersey: John Wiley & Sons. p. 186. ISBN 978-0-470-02387-7. This page was last modified on 10 November 2013, at 15:50.